Mumbai, May 1, 2016: On 21st October, 2015, Michelle Kakade, The Queen of Endurance undertook an epic journey on foot that has never been attempted before encompassing the length & breadth of our vast country covering a distance of 5970 kms along the Golden Quadrilateral that connects the 4 major metros of our country namely Mumbai in the west, Delhi in the north, Kolkatta in the East and Chennai in the south. This run was flagged off from the Gateway of India at 7 am. Michelle covered the entire distance by foot. 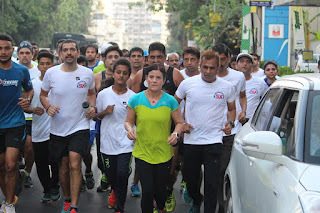 Running about 35 kms on an average every day, Michelle Kakade, the Endurance Queen has successfully completed The Indian Golden Quadrilateral Run of 5970 kms in a record time of 194 days spread in 167 stages across the four metros Mumbai, Delhi, Kolkata & Chennai and 56 towns. Michelle is attempting the Guinness World Record for “The Fastest time to travel the Indian Golden Quadrilateral on foot (female)”. With only 27 rest days she has done the equivalent of running 142 full marathons in this period from 21st October 2015 to 1st May 2016. Michelle ended her epic run at the same spot she had begun, Gateway of India. During the run she was largely injury free due to her constant medical attention she received on daily basis. Her routine consisted of starting her run at around 3:30 am each day and ending it around 9 amof that day. Rest of the day was spent in recovery and physio theraphy. At key cities she visited charity activites of the charity partners. In most major cities, runners came out in large numbers to give her support and solidarity. She was received by the former Royals of Satara, appeared on Start Sports as the event personality of Airtel Delhi Half Marathon and invested as the Brand Ambassador of the Rotaract Club at Kolkatta. Numerous newspapers and Radio coverage was afforded all along the route, thus inspiring several thousands to take up running for good health. Mr. Anil Kakade, CEO & Managing Partner of Kakade Associates and Michelle’s husband mentioned that Michelle was indeed a brave women and that he had great pleasure in enabling her to notch up her several achievements. Along the route, Michelle encouraged first time runners to take up running for good health. Michelle herself is a formidable endurance athlete. She has 3 Limca Records to her credit all in the arena of endurance running. Before she started the run, she had been tested by the leading medical fraternity of the country and they found themselves satisfied that she could take the challenge. In order to stake her claim for the Guinness World Record she has employed the latest in technologies to authenticate her title. Using the latest in GPS wearable technologies her run location, heart rate and pace were available in real time basis. She ran along the Golden Quadrilateral as defined by the National Highway Authority of India. On each day she has marked the spot where she stopped and the next day resumed her run from the same location. Geo-tagged photos as well as videos which have been uploaded on daily basis will serve as further evidence of her progress. Michelle was medically tested extensively by Dr. Ashish Contractor, Cardiologist and eminent sports physician as well as Dr. Mohsin Khan, Sports Physiotherapist from Heal Institute. She had been trained for the past several months under the expert guidance of Mr. Raj Vadgama who is himself a Limca Book of Records holder for having run the Bharathon of more than 9000 kms. Infact Mr. Vadgama joined her in many locations to motivate her. Dr Gayatri Thakoor Vyas is her sports nutritionist and she was closely monitoring her meal plans. Team from Craft Hut, Vinayak & Dhanraj handled her daily operations. Pic2Go, photography partners and Motor Home adventures were the travel partners. The event is being backed by an equally formidable galaxy of partners. The event organizers are YouTooCanRun, a leading sports management company wholly devoted to promoting running and are being supported by Procam the organizers of Standard Chartered Mumbai Marathon. Pics2Go, the leading mass event photography partners pitched in while the charity partners were Concern India. Radio Mirchi were the Radio partners. Heal Institute acted as the recovery partners by providing a full time Physio on board the entire duration of the event. Unived are the supplementation partners while Garmin assisted by providing her with wearable technologies. About Michelle Kakade – The Queen of Endurance lives every woman’s dream. She emerged from the ashes of an over-protective motherhood and mundane homemaking. Like the proverbial phoenix, she shook off the layers of complacency that lethargy had deposited on her. At a time when most others were huffing and puffing their way through mid-life crisis, Michelle reinvented herself. Today, as she skips merrily towards 46, she has an identity that would leave most of us wonderstruck. Hers is a story of ‘making it happens’. It is a story of the unlimited powers of the mind and body. It is a story of steely resolve and mind-boggling endurance. •2012 - Michelle became the only Indian to win membership into the elite 4 Deserts Club. •Michelle set another record in 2012 by running the longest time on a treadmill. 171.2 kms in 25hrs.